BOScoin is a Self-Evolving Cryptocurrency Platform for Trust Contracts. "Trust Contracts" will provide a decidable and approachable framework for creating and executing contracts on the blockchain. The "Congress Network" is aimed towards creating a more democratic and productive decision making process. And the incentive scheme and issuance plan is aimed towards creating value for the coin while deterring the centralization of power. The Modified Federated Byzantine Agreement algorithm will allow for low latency transactions while being more energy efficient. BOScoin aims to overcome the technical and operational issues inherent in many cryptocurrencies. 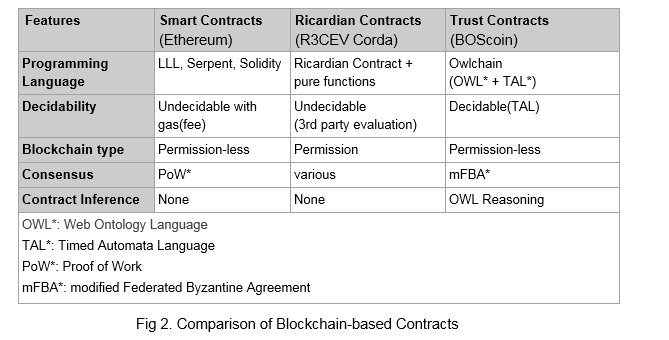 Trust Contracts are securely executable contracts based on a decidable programming framework called owlchain, which consists of the Web Ontology Language(OWL) and the Timed Automata Language(TAL). 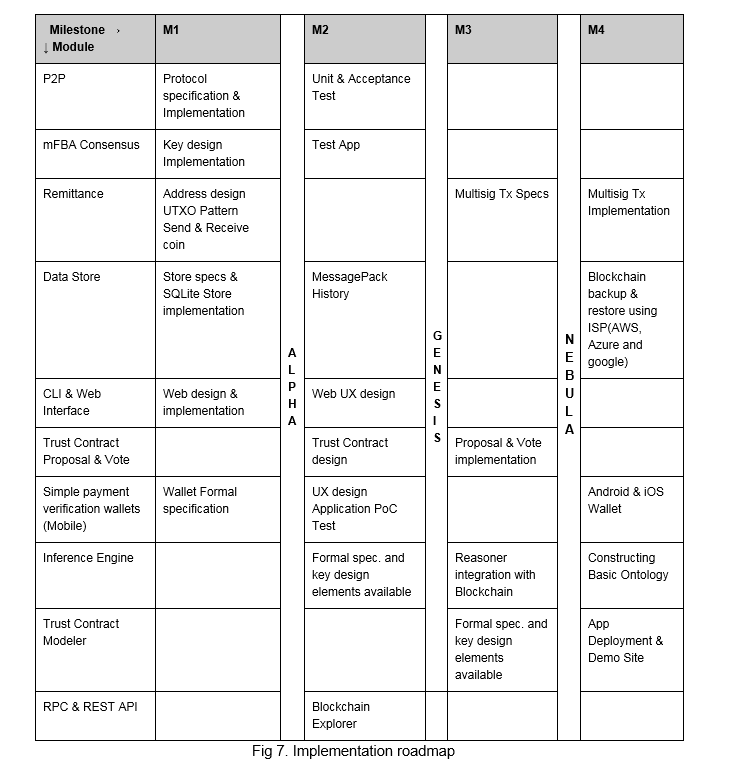 Trust Contracts aim to overcome the issues regarding non-decidable smart contracts by using a more contained and comprehensible programming framework which provides secure and decidable transactions of contracts. The owlchain’s hierarchy was designed as a general blockchain model to accommodate multiple ontology models. The owlchain combines the feature of the reasoner and consensus protocol to handle the Trust Contract. 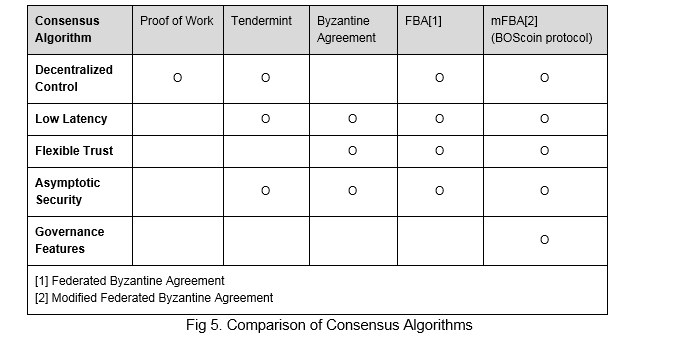 BOScoin constitutes a governance system whereby node operators referred to as the Congress Network can participate in creating and voting on proposals in order to continuously improve the software and ecosystem. 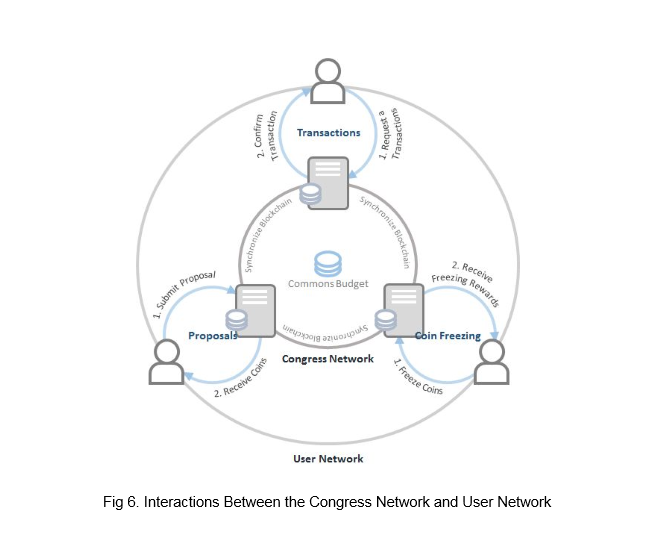 The Congress Network interacts with non-congress users in three ways; transactions, proposals and coin freezing. 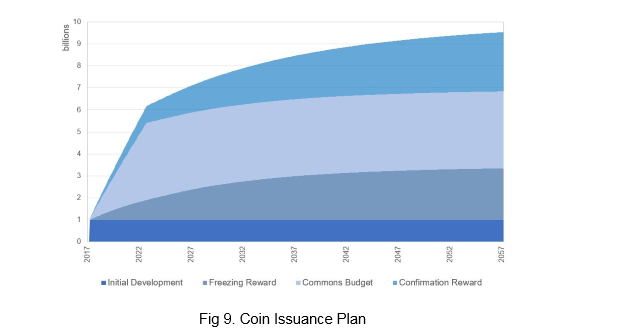 New coins are issued in four ways; initial development budget (0.5bil, 10%), confirmation rewards(1.8bil, 36%), freezing rewards(0.9bil, 18%) and the Commons Budget(1.8bil, 36%). We aim to issue a total of 5.0 billion coins over the next 100 years. These values are subject to change. ● Self-Evolving Cryptocurrency Platform ● JOIN ICO NOW ! UPDATE: In order to better focus on the “BOScoin Fundraising Event” (May 10th, 2017) we’re going to postpone updating the “Public Bounty Tracker” until AFTER the Fundraiser Ends. You can earn BOScoins by participating in any of our following bounty campaigns leading up to and during the ICO! The complete bounty pool is 5,521,873BOS (equating to 2% of the BOS available at ICO or 138.047BTC or US$140,000) to be split between this program and technical reviews. For each bounty application, you will need to submit a separate bounty application via an online form. The form is very simple and quick to complete and will assist us in determining the fairest way to distribute the bounties - Links to the application forms are available via the individual bounty campaign descriptions below. The process we distribute the bounty differs slightly for each campaign, but nonetheless, it’s quite straightforward. Any remaining funds in the bounty after paying out all the bounties may be awarded to applicants who missed out (i.e. due to individual campaign bounty pool cap). Please do not forget to apply once you have completed the requirement for the bounty!! By applying to one of the bounty campaign categories, you agree to the terms and conditions of the BOScoin Bounty Program as set forth herein. Subscribing does not mean you will need to donate any funds, however it will set up your personal account on the system where you can track BOScoin's ICO progress and also act as a wallet during the ICO. Submit the short application via the below link including your email, selecting the "ICO Subscription" option. Subscribe to our Newsletter or join our Slack channel to receive a maximum of 300BOS* (approx US$7.75). - Any abuse will be banned and reported immediately. - Applications which meet the above conditions will be awarded by a first-in-first-served basis, in accordance to the application submission. Spread the words through your own channels! Available only for Twitter accounts with 500+ followers. Follow the BOScoin Twitter account and tweet/retweet on BOScoin to receive 200BOS (approx US$6) - one time application only. - The tweet/retweet must be appropriate and not devalue BOScoin. - Provide Twitter ID via application form including link to each tweet/retweet. - Applicant must remain liking the BOScoin Facebook page for the duration of the ICO. Share/Like/Comment a BOScoin activity on facebook to receive 40BOS* (approx US$1) (capped at 200BOS per week and 1000BOS per applicant/person). - Provide Facebook account name and link to each post (like/share/activity) including date and time via application form. - Quora blogs are excluded from this particular campaign. - Submit application via link including link to the blog post. Use the BOScoin signature and avatar (according to your profile level) below to receive BOScoins! - Submit application form once with a link for us to view the avatar and signature on the forum. Create a community (e.g. WeChat and QQ for China, VK.com, Ok.ru for Russia, LINE for Japan or a just simple Slack channel) with a total of 50 members to receive 15,000BOS (US$458). Community members will be registered on our website for as long as you wish, or until we deem appropriate (note this may extend beyond the ICO period). - Manage the channel appropriately until the conclusion of the ICO (i.e. answer all questions appropriately, ensure BOScoin is promoted, etc). The community manager will be rewarded 5,000BOS (US$153) if the community reaches 100+ members. - Creating and managing a country specific community is a prerequisite. - To be eligible, you must use proper language, i.e. the use of only google translation will not be considered fulfillment of this bounty. You can track the progress of your bounties in our public Google Sheets. Updates to the sheet will be made on a weekly basis. It lies in BOScoin’s sole discretion to decide whether or not the criteria to qualify for a bounty allocation are fulfilled (e.g. whether or not a tweet/retweet is appropriate and does not devalue BOScoin). Awarding of bounties may be withheld at the discretion of the BOScoin team — the circumstance would usually be due to conditions not being met. Additional bounties may be awarded, at the discretion of BOScoin, in the event that there are leftover BOS in the complete bounty allocation pool. Any disputes arising out of or in connection with the BOScoin Bounty Program shall be exclusively decided by the ordinary courts of the city of Zug, Switzerland and in accordance to Swiss law. - The ICO date has been delayed from “April 17, 2017” to “May 10, 2017”. - The ICO will be carried out from “May 10, 2017” to “June 20, 2017”. meh, thats just my opinion, ill check back inna few weeks, best of luck with your "smart-contract token chain?" im not even quite sure what this is yet..
i am interested to watch this one evolve! I am looking forward to other information. If the number of coins is too total, it will be hard to raise the price and it means that you have a high chance of dying. at 1 satoshi thats a 100BTC market cap at 10 billion coins -- ok that seems doable. I reserved this thread. I'm waiting for new plans and campaign bounties from Dev. It looks good . Keep up with your work , Dev. in any activity we needs trust and after that trust we are able to do our job.as more people are interesting as more information are here. Any bounty for translation, sir? I reserved for this thread to Indonesian translation, if you need. kindly regards. Thanks for pulling the screenshots and reading through our paper. Another coin with too many supplies. i am not optimistic with this kind of coin but i guess i can make a try to be engage with this kind of coin. the distribution is quite different but i guess it's just different in terms, initial development budget. i knew you planned every steps, so i wanted to wish you the best...i'm watching and waiting for something that will encourage me to adopt this coin. The website and technical paper will be up soon!